I know I`ve been a bad bad person for not finishing my top. I was going to, really, but life interfered, I guess (I`ll save you from explanations). I feel especially bad for not checking this blog out as much as I should have - but I plan to catch up! 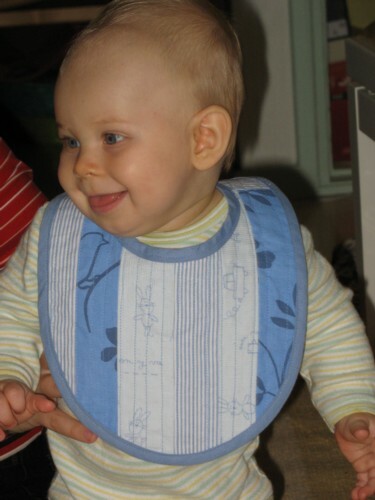 I did finish the current project though: a quilted baby bib for my nephew, here modeled by it`s cute-but-too-excited-to-stay-still recipient. Upset with my failure with the previous project, I didn`t want to announce I was going to make anything in time, since I wasn`t sure I was really going to make it. But I must say this was a great project! I`ve been planning to give a try to patchwork, and had fun making this. (Though sewing bias tape (my first time) was hellish, just as I suspected it would be. I´ve always known bias tape is evil.) I´ll surely be making more patchwork in the future. See the other side of the bib and some details in my blog. EDIT: now the link should work!